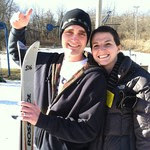 One of my Christmas presents to Kley was an outing to Sleppy Hollow Sports Park for a day of winter fun. We brought my little sister, Kayla, along too! 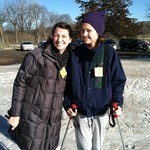 We went skiing and tubing. It was quite fun and neat to do something different! Kayla and I (not the best picture, I know). 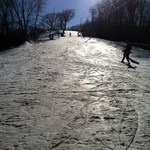 We hung around the beginner slope while Kley ventured onto the big ones. Most of the trouble was hanging on to that crazy rope that yanked you to the top! Tubing was so crazy fast down those hills that I couldn't get a good picture. We were flying!